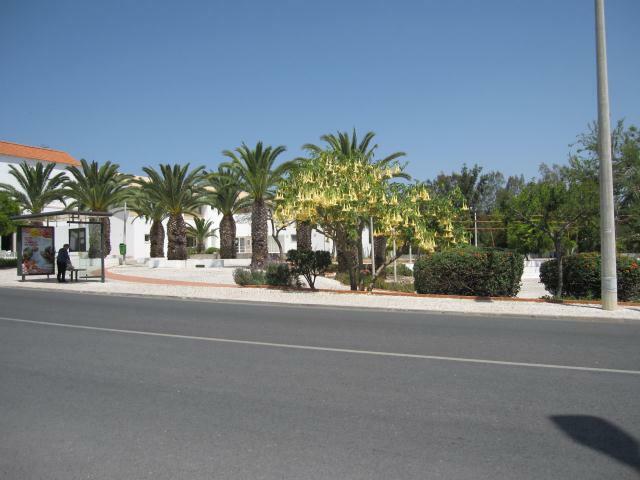 A new page of Tavira-photographs all on this page will be our own originals.Pictures we have taken on our visits to the Algarve.There are many as we visit about three times per year,to visit and check on our apartments and for a holiday in the sun. Tavira-photographs original The amazing Roman Bridge. A Real Roman Bridge,just imagine. One can still walk in the footsteps of our Toga wearing ancestors. How many places in the world is there a 2000 year old piece of architecture still in daily use. My mind boggles with that fact whenever I walk over it.Gladly it is closed to modern motor vehicles as they would spoil the sense of history.The bridge just belongs here it is Tavira and all seems to revolve around it,as long as one walks around drinking in the history of this ancient town. If your mind is on the latest fashions or latest gadget then one might not notice the sense of history.One might as well go to the new shopping mall or the beach. 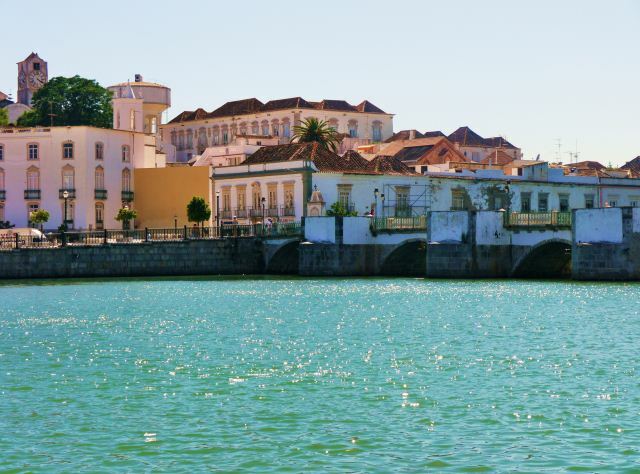 Come to Tavira for the ancient "vibes",please! 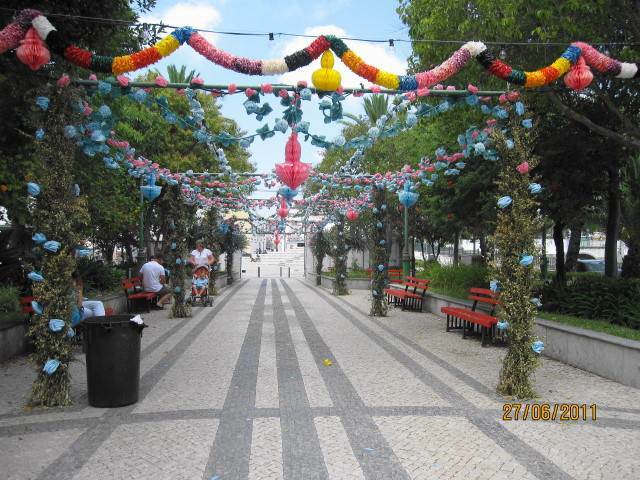 Another original you cannot get anywhere else,Tavira-photographs.The picture shows the bunting used for a festival in the forefront area of the municipal market (a picture of the municipal market is just a scroll down the page).Like the Spanish people,the Portuguese love and do a festival with great vigour. People of the Iberian Peninsula seem to be trustworthy with drink.You just do not see people staggering around in a drunken stupour that you so often see in the United Kingdom. The Portuguese hold festivals at the "drop of a hat",they need very little excuse to enjoy life.Did you hear this you English readers,enjoying life without spending lots of money or getting sozzled from partaking of too much alcohol,is still very much possible.However the EU is working hard at trying to reverse this annoying habit of the Iberian people of enjoying themselves.Especially at very little cost. Yep' it is a very annoying fact but the only people who will ever benefit from the EU are politicians and the unelected Dictators who sit above them in even more decadent luxuriousness.These are the Dictators who really "pull the strings of power". 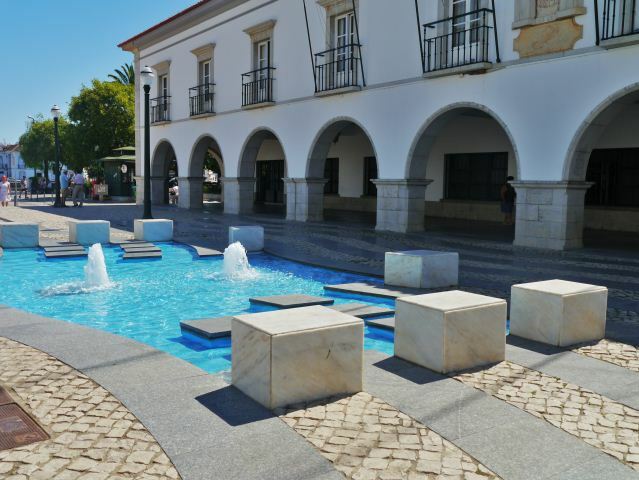 This Original photograph is of the Municipal Market which is the hub of life and activity in Tavira.You will find it right beside the river and it is worth a visit just for the shops and cafes inside.The cafes are all on the river side so you can sit outside and relax right by the river. You can get small snacks or a full meal depending on how hungry you are,or just relax with a drink. You will find a small gift shop which sells the bags made from the Cork Oak of the Algarve.They are really lovely but a little too expensive for most tourists nowadays.Portugal has not been in the EU as long as say the Uk where prices reflect the lack of money in consumer pockets.Not all in Portugal have got their heads around this fact yet.Either that or it is lingering stock.Even so they will never sell goods at heavy prices so they just as well give up and mark the prices down 'a lot'! 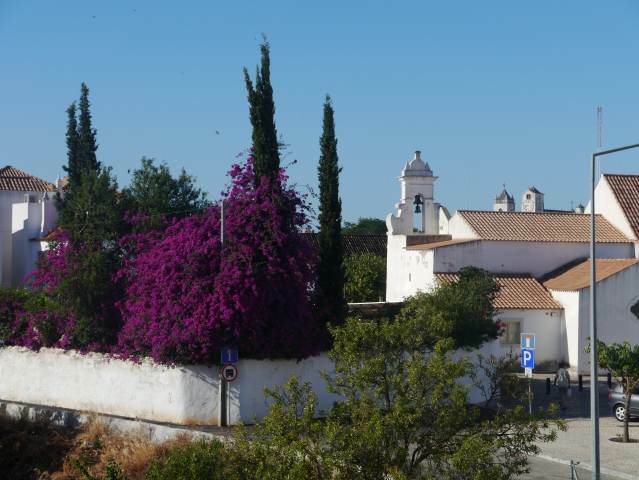 This picture was taken from the verandah of our hotel room,early in the morning.We stay in a hotel before going to the apartments so my wife can have a break from cooking for a few days.This was taken from the Porta Nova hotel in Tavira. The pictured scene is the epitome of Portugal,the Algarve and Tavira in particular.The architecture and the colour are everywhere you go in this lovely town which still boasts a lovely Roman Bridge, 2000 or so years old.This is a place to put on your list of places to visit.Not only does Tavira have beauty and colour but it has beaches to die for and is the most sun drenched place in Europe.With temperatures well into the 30's C the heat is much more bearable than elsewhere as the whole of the Algarve has the gorgeous Atlantic Ocean air and breezes.This is known as the "Coast of Light"
Right by the river on the opposite side from the central Municipal Market.As you can see Tavira is a great large town to wander around.Easy to waste whole days wandering around. For those who like their history tavira dated back over 2000 years,before the Romans.The Romans were probably the first to make it an important town and much of their architecture in use can still be viewed.The main piece being the still in use Roman Bridge,open to foot traffic only nowadays but I can always see the horse and carts in my mind. Really the history and architecture carry on down the ages in this timeless place and their are museums,historical churches and a lovely castle. 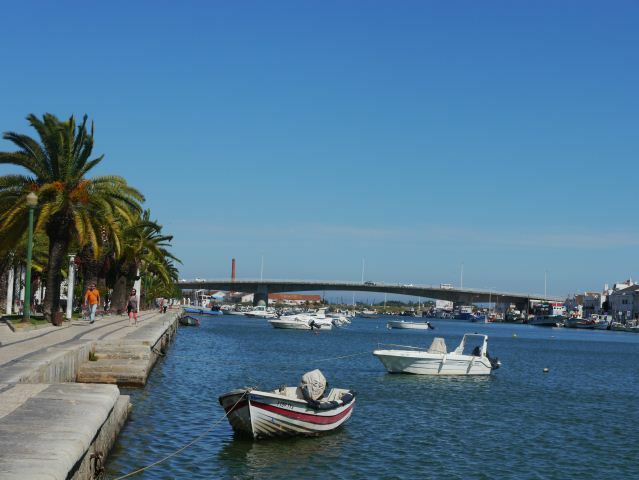 Favourite pastime is just relaxing in one of the many riverside bars,cafes or restaurants and enjoying the Algarve sun and its famous air. More TAVIRA-PHOTOGRAPHS coming soon Tavira-photographs original showing the heart of Tavira Town. This is the Camara offices (council offices).Beyond the water and fountains is a large open area where many open air concerts etc take place. Would be right outside the Camara would it not. To the left you would find a row of cafes and bars with plenty of outside pavement seating. Up ahead is the river and if one turns right by the river the Municipal market will be reached. All this area is dominated with shops,cafes restaurants and bars.It is the social hub of this lovely town. Tavira-photographs original of the interior of Tavira Castle.Yes that is inside the castle. It has been made into a garden inside the still standing walls.My daughter is booked to be married inside the castle in August 2013. As you can see it is really pretty,with our picture showing the central pathway.The entire internal area is like this with paths going off in all directions.These paths move ever outwards towsrds the walls. Not a massive castle but still a fair size and with views right over the city. One can still climb the old steps up to the ramparts. Not me as I am in a wheelchair but anybody of reasonable health can go up and must have astonishing views all across the town and in every direction. This castle is right in the centre of the town so there is not just one view.The ramparts literally cover north,south,east and west. This is a jewel not to be missed,when visiting East Algarve.With a lovely courtyard and restaurant just outside the castle quite a few relaxing ours can be spent "mooching" around this ancient site.I can imagine it must have been a site to behold in Roman times when Tavira was a very important port. 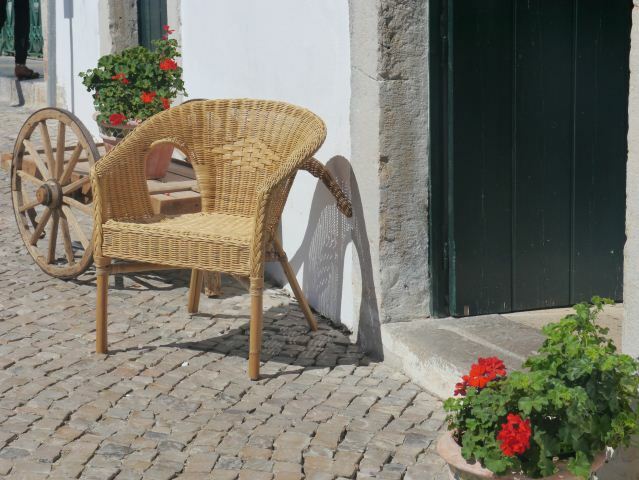 Tavira-photographs original.CROSS THE ROMAN BRIDGE AND SIT DOWN IN A TRANQUIL SPOT! If you cross the Roman Bridge,which you can only walk over,you will immediately come across this scene. It is just outside a small shop,I have to confess my memory lets me down as to what type of shop it is. 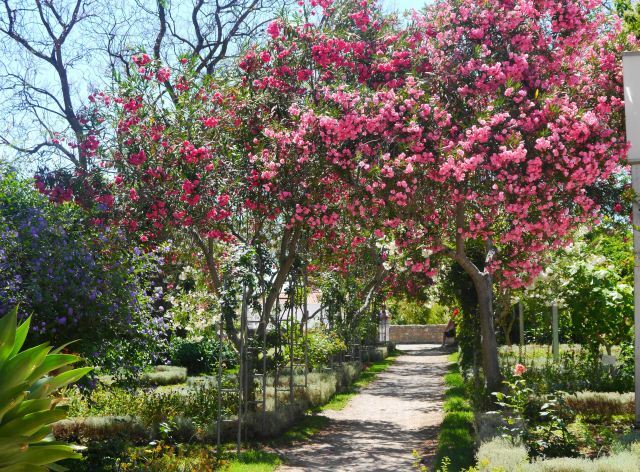 This type of scene is just typical of Tavira,there are parks gardens and flowers everywhere. Tavira is for relaxing,nothing else,just passing time.This it has done for over 2000 years.Cafe pavement culture is to be seen everywhere and they have a better climate for this type of life than most of France which tries so hard to sell itself as the capital of street cafe culture.I have to tell you the Algarve does it better. Tavira-photographs original.Walk past the green market following the river and you will come to the ferry dock where you can book many boat trips. Cruises long and short out onto the Atlantic ocean and then following the Algarve coastline both East and West. These are well worth taking although just as with anything these days,it can be a little expensive. 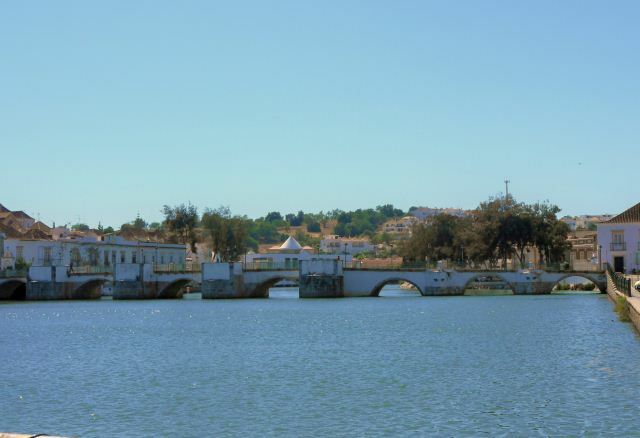 The picture above shows the edge of Tavira a little further on down the river,where another ferry can be picked up,over to the Islha Tavira. That is what you can see in the photograph.It is apparently a great day out.I say apparently because I have not done this trip as I thought it would not be easy with a wheelchair. However my daughter and her boyfriend say they think it should be ok for me,so I will be giving it a go soon. According to my daughter and all the guide books it is really lovely over on the Island but is frequented by the filthy rich brigade. She says they were tipping the waiters with 20 euro notes. Not my daughter,no the wealthy tourists! Of course there are establishments for the less wealthy to "feed and water". I understand there are boardwalks you can use to walk right around the Island. 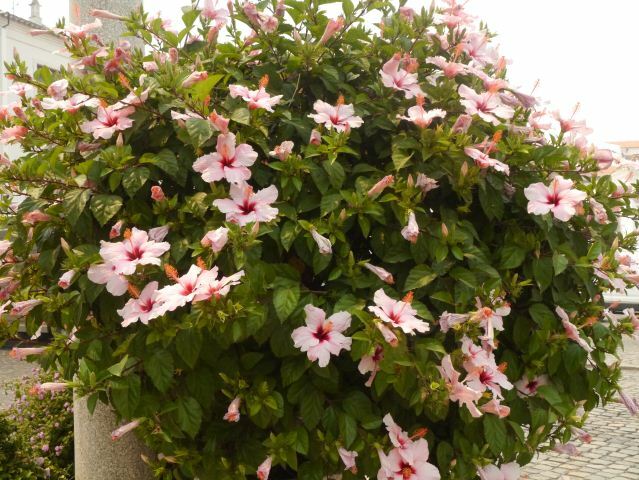 That is the name of this flowering shrub ,original by Tavira-photographs. This is right in the middle of the road at the end of the main traffic square.The traffic actually has to go round this island to go back up the square.I had to venture out into the middle of the road to get this close up shot. I cannot be certain but I thought I heard a few Portuguese words that might not have been too polite.Just guessing by the tones of the voices. "sodem'",say I,who do they think they are! Moaning at tourists going about their legitimate work. 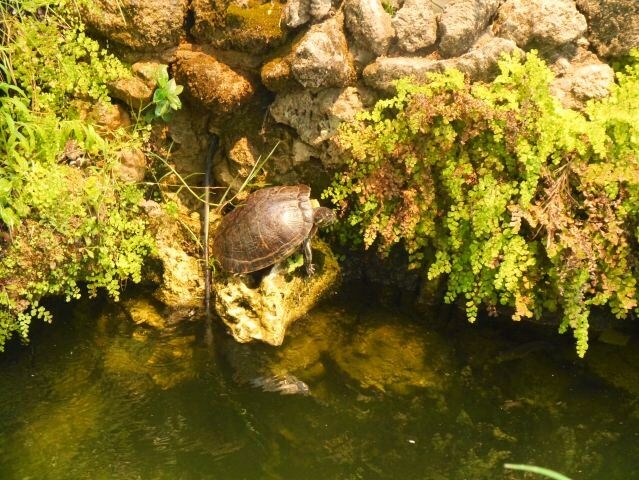 Find your way over to the river in the centre of Tavira and you will easily spot te Banstand.You will need to go up really close to the railings and you will look over and see the moat and look carefully and you will start to see there is a fairly large family of tortoises in residence in the water.|They do seem to like having their photographs taken and not a lot seems to bother them. Just thought this was something interesting to look out for when visiting this ancient floral town. This is a scene you will see repeated over and over in the streets of Tavira.Cafe culture,small shops and flowers and trees sum up the town very well.Oh,don't forget history as well. 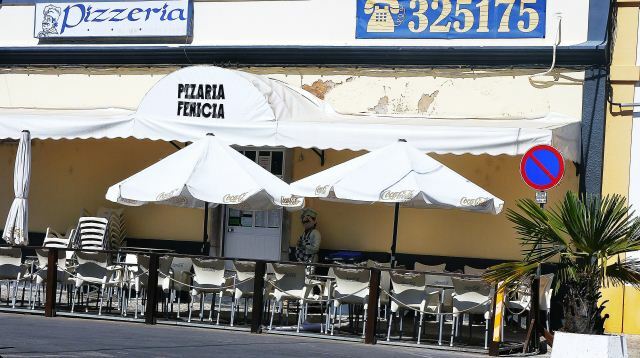 I chose this picture as it shows so well the eat and drink in the streets style of lovely Tavira.The Algarve does have the perfect climate for this type of socialising and it can be carried on most of the year. This is on the other side of the river.When I say that I mean the other side from the main Squares and the Green market alongside the river.I suppose this other side is slightly quieter in the day but because the square this Pizzeria is situated on is mostly like this it can be a lot busier at night.Certainly in the summer season.Despite the cost of living rising drastically because of the EU austerity measures,these small eateries have had to keep their prices down.So many tourists are eating in or staying in establishments with full board,that these little restaurants have to keep their prices low. Down by the river you can so often look up at the lovely architecture of the town. 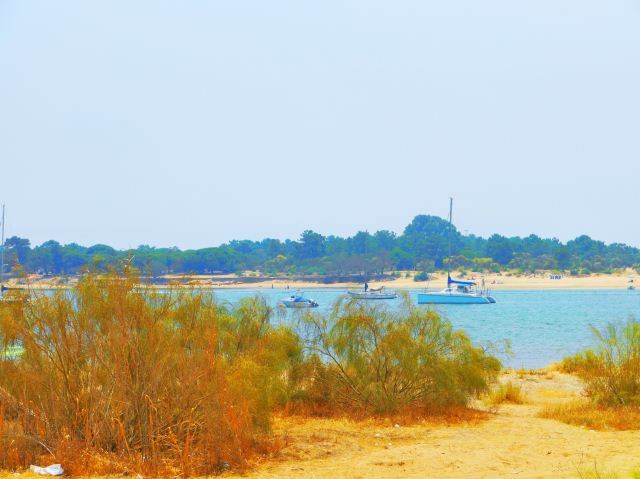 Another Tavira-photographs original taken on a red-hot day in June 2012.I can so clearly remember what a lovely day it was and how the sun sparkled so strongly off the river water. The heat is a lot more bearable here,there is not the humidity or heaviness or humidity associated with the heat of so many countries. The picture just demonstrates how varied the architecture of this lovely,historic town,is.Even the outskirts of the town are nice because of the refusal by the local Camara (council) to build above 3 stories high.This gives the town a more authentic appeal and avoids the oppresive feeling which permeates around high rise tower blocks.I can never get away from thinking how miserable it must be living in massive blocks of flats.The whole of the Tavira area is under this rule of no more than 3 stories high and makes the area one of the most attractive on the Algarve.